First Communion, also known as Holy Communion, is a Catholic ceremony in which children of seven or eight years of age receive the Eucharist (consecrated bread and wine/the Body and Blood of Christ) for the first time. In many families a party accompanies this sacrament, including special new clothing for the children involved, catered feasts and professionally arranged floral displays. 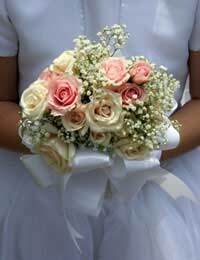 Understanding the flowers commonly associated with First Communion, the types of arrangements usually involved in these events and how to help those who request floral gifts for the children and families who are celebrating should help florists best prepare their stock for these celebrations. Single buds to be carried or laid in a Bible/book. Pomanders hung from short strings. Floral hair wreaths, headpieces, hair clips or hair combs. Single blooms to insert into the hair. Floral garlands or bows to hang from the side of church pews. Large bouquets for the corners of the church. A standing bouquet by which children or families might take pictures. Large arrangements in the shape of crosses, Bibles or hands in prayer. Guests invited to First Communion ceremonies or celebrations may wish to bring a floral gift to the child involved or the parents hosting the festivities. Simple bouquets are always an appropriate gift. Try to talk people out of large displays or surprise centrepieces which might clash with or overshadow the floral arrangements the family has already chosen. A unique option might also be a gift certificate with which the child could have their special flowers dried and/or pressed so that (s)he will be able to keep them for the rest of his or her life. Most children who make their First Communion will have some sort of flowers involved in the day. Understanding the flowers most often associated with these celebrations, the types of arrangements typically ordered and what kinds of floral gifts are appropriate to be given by guests are all important parts of boosting your floristry business and taking advantage of this niche.